We’d love your help. 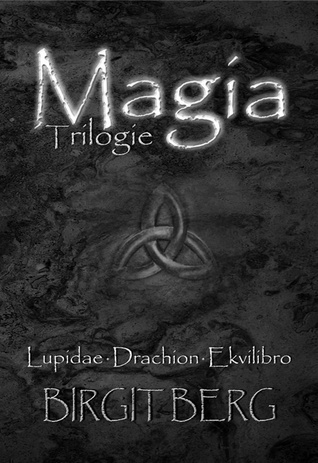 Let us know what’s wrong with this preview of Magia Trilogie by Birgit Berg. To ask other readers questions about Magia Trilogie, please sign up. Hé Birgit, is Ekvilibro nog los verkrijgbaar? Ik heb de eerste twee delen los (in de zogezegde oude versie :)). The Dutch author Birgit Berg came out with her first fantasy book 'Lupidae' in 2010. 'Lupidae' is the first book of the Magia Trilogy. The second book of this Trilogy, 'Drachion' appeared the following year. The third book of the series, 'Ekvilibro', was released in december 2012. In the Magia Trilogy, Berg weaves an intriguing epic around the girl Syribil, her bodyguard Jhon van het Gilde and the The Dutch author Birgit Berg came out with her first fantasy book 'Lupidae' in 2010. 'Lupidae' is the first book of the Magia Trilogy. The second book of this Trilogy, 'Drachion' appeared the following year. The third book of the series, 'Ekvilibro', was released in december 2012. In the Magia Trilogy, Berg weaves an intriguing epic around the girl Syribil, her bodyguard Jhon van het Gilde and the specially trained Nhirse soldier Ri’shana Surilei. Their search - which goes beyond the classic conflict between good and evil - is a psychological journey of discovery in a world in which fear, chaos and darkness have the upper hand. Birgit Berg is a master storyteller. She introduces her own style to a world dominated by American and English authors. Sometimes raw, sometimes moving, but always authentic. Berg writes for both adults and young adults.